Board 8 > Fire Emblem Heroes Discussion Topic Part 23: Pitybroken by Legendary Lyn. that's how it goes with red. i'm up to 5 red pitybreakers in a row spread across various banners, with the last red focus before that being Laegjarn from the 2 unit banner last year. at least, if you don't count legendary banners or the free Fir i got from her BHB banner, who's worse than any actual pitybreaker. granted, my red situation in that time is about as good as can be given that. one of the units i was pulling for was NY Gunnthra and got her for free from the anniversary. from legendary banners, i got Legendary Marth and two dancer Micaiahs. and the pitybreakers themselves have been great; Karla, Celica, Ayra, Siegfried and another Ayra last night while going for Palla (RIP potential future Ayra pitybreakers with that banner change). and honestly i didn't even spend much in red in that time. maybe 150 total between Gunnthra, Tibarn, Palla (since i was pulling all colors on the Tibarn banner). Forgot to post about it here yesterday when it happened, but I pulled Mikoto, bringing my off-banner streak on new unit banners to 14. This has a 0.006% chance of happening. The last on-banner pull I had was now over 7 months ago. You have a longer one than me. Mine's ended though too. Started after I got Tibarn and ended with Spring where I got Marisa. Also got Lethe on this one. There's a satisfaction in finishing up Forging Bonds on the day you've collected your last daily orbs from it. Left reminds me of Fae. People seem to think the person on the left is Genny. i also thought of Fae but yeah Genny seems to be the consensus. not sure at all about the right, the best i can come up with is Azura but i don't actually think it's her. My first thought was Genny and Soleil, but I don't know. Is this supposed to be the bridal banner? Or maybe a new theme? No, this isn't the Brides banner. Brides banner starts in May and goes into June. i don't think it's bridal, looks like there's marshmallows on a stick. brides aren't until May or June. Looks like Genny and Libra. I hope so because I really don't need another banner with units I want! Although a camping theme seems really cute. SantaRPG: Turning "i"s into "l"s since 2008! Genny is an adorable sheep. Probably not super popular in the grand scheme of things(Being neither a mascot or a common waifu), but a good character in Echoes. Going by how Intelligent Systems combines different versions of characters, unrallied Anna isn't hugely more popular than Genny. CYL3 results with rallied Anna are likely too new to mean anything yet. *Rank is based on retroactively combining characters in a similar way to CYL3. All Anna's votes should be counted together I will fight to the death on this hill. Also I know it's not Nino but if they had the Nino family out camping together Adult Nino, Jaffar, Raigh and Lugh plus Merlinus through Tempest Trials it would be too pure for this world. I would actually spend money again if it was that. I advocate Kaiser Advokaiser for winning Guru! I thought about them but for camping Merlinus as a pack mule fits too well. Also just pity broke on red for the 5th time this banner. On the plus side I now have every single Muspell unit! 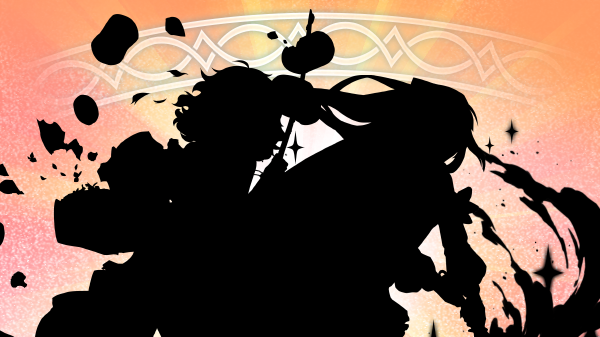 Actually looking at it again the long hair could def be legault. It looks like he's holding a pair of pruning shears, which would be a throwing weapon. yeah I'm willing to lock this in as 100% chance of it being nino-family picnic. Consider it called. And it's a picnic themed banner? It's a... mixed banner, it seems. Also Leo is the TT unit. Hopefully this one is viable. So I'm not sure how to feel about this. It's all alts, but it's all alts of people who don't have an alt(TT excluded) so that's nice. Beast effective weapons is nice, but the skills that are only useful in Aether Raids, it's like they really want to wring every dime out of that mode. Cool I'm pretty tepid on this entire banner. I love Felicia but I don't really need any more armors so I can save some orbs for once. Glad they gave us another Fates Royal alt instead of something from echoes or another fates maid/butler. I always say this game could use more fates royals. you could even give me picnic Elise! That's a royal! I see you also love the adorable. Also yeah, Lilith is long overdo(As is Nils). Ugh, those AR skills are super obnoxious. I think I might hate them even more than the Duel skills. Alfonse is a free welfare character. Looks like Cygames is doing what they seem to do in Granblue Fantasy, which is making collab characters free. Better luck next time Leo. At least you have a plausible chance at getting a 3rd alt unlike many other characters. Leo pissed off a dev over at IS. I don't know what he did but man, he just get shafted every time. QR isn't the 4* one. Leo will never be good because they have a "thematic" stat spread in mind for him of low speed above average everything else and it's just bad because IS doesn't understand stat values or something. FEH makes it very tough to be a Leo fan. Though yes, at least he's popular enough there's a chance he gets a good alt eventually.